A few years ago, I was diagnosed with the impressive-sounding Degenerative Disc Disease. As a result, my back surgeon—a good guy—told me I was looking down the barrel of inter-vertebrate cushioning implants for my lower discs. This would be my third operation in 12 years, and perhaps the most invasive, as it involved soft-tissue surgery as opposed the key-hole method. Given the prolonged recovery from my previous operations, which saw me borderline addicted to painkillers and still with residual back pain, this most recent prognosis was the tipping point. Despite the extent of surgery, technically there was no guarantee that I’d ever surf again, or at least to the same level. So, I took matters into my own hands, and I set about trying to find a solution that would allow me to at least postpone the operation, keep me surfing, and enable me to enjoy, in as far as I could, a fully active life with my then-still-young family. My problems were, however, compounded by the physical act of surfing. More precisely, arching my back as all surfers do while paddling was impacting the underlying disc condition. The more I surfed, the more pain I was in, and despite trying to remain fit in other ways—for example, through swimming and walking—surfing began to become more arduous and less frequent. 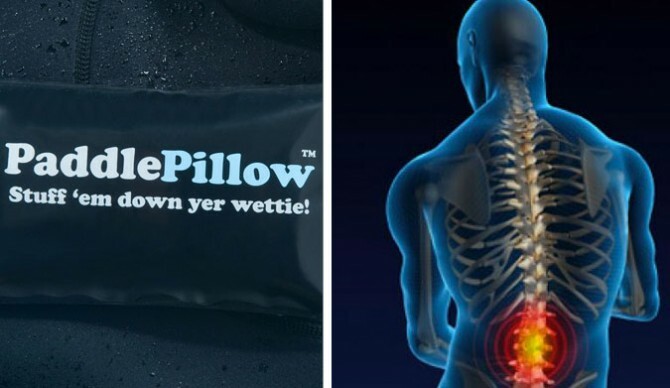 Paddle Pillow can help you paddle stronger and surf longer. Just stuff ’em down yer wettie! Something came to me during an early spring session. While, feeling toasty, I took off my gloves and pushed them into my wetsuit for safekeeping. I realized that my gloves supported my chest as I laid on my board. To my surprise, it actually eased pressure on my lower back. There was something to this, and I was determined to do whatever it took so that I didn’t have to stop surfing altogether. I clearly needed a sort of cushion. I tried a number of possible solutions, including bubble wrap and even polystyrene computer casing cut down to shape. These were neither practical nor were they scalable. After all, if I could find something that helped me, perhaps it could help others. That said, aside from the fact that I knew this worked for me, maybe it could help the 1 in 4 surfers who suffer from lower back pain. My lightbulb moment was in a camping store in Melbourne in January of 2014. I stumbled on an inflatable head support which became the template idea for Paddle Pillow. I found an agreeable supplier, gathered together what personal funds I had, designed the specification, developed a prototype, created the branding, bottomed out the costs, and started production. Our first delivery of Paddle Pillows arrived in mid-May of 2015, and our first order followed shortly after. By December 2015—thanks to a few initial sales—I’d started to recover some costs and had sold enough to make a small donation to Jesse Billauer’s Life Rolls On foundation; something which I’ve continued to do every year. Truthfully, I’ve given away more Paddle Pillows than I’ve sold. But that’s okay. This was, and still is, less about making a buck and more about helping other surfers stay surfing. Perhaps it’s a way of giving something back for all that surfing has given me. From dawn runs to sun downers to onshore slop to offshore perfection, I’ve enjoyed every minute of it. It’s unfathomable to think it could have been taken away from me: the good and the bad. It’s not just a sense of personal fulfillment, but the determination to find a way through life’s challenges. Now, who’s down for a surf? To see learn more about the Paddle Pillow and order one for yourself or someone you know who suffers from lower back pain while surfing, check out PaddlePillow.com.